Teach your students about the people who decide which laws to pass. Activate the critical thinking skills of your students by having them decide the laws that they would like to modify! Test your knowledge of the Civil War by completing this fill-in-the-blank worksheet! Read each sentence and write the word in the blank to compete the sentence. Learn about the USA's three branches of government and where each one works. 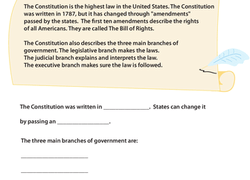 Teach your kids about the U.S. government with a lesson on the Constitution. How much does your child know about her local government and city hall? Help her investigate her community with this printable. 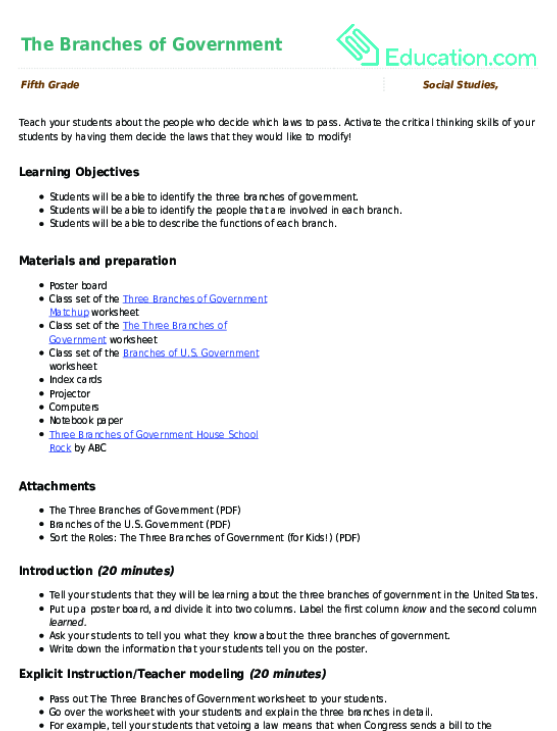 Take a fun approach to learning about the Bill of Rights! Find the words relating to the Bill of Rights in this word search exercise. Challenge your intermediate student with a quiz about the Civil War! He'll answer questions about important people and places in the Civil War. Resources are an important concept in economics. Introduce your child to three different types of resources with a fun worksheet! Your child will enjoy adding colour to President Obama's picture, while learning that he is our country's forty-fourth president. This year three social studies worksheet will give your child a head start on the Bill of Rights starting with the First Amendment and easy reading practise. Your fifth grader can see how well he knows the ten amendments by matching the amendments with their descriptions. He'll have all ten memorized in no time!